In 2014, Pool Pros expanded our pool building capabilities with the addition of KUSTUM KRETE SP®. This is not simply a type of pool, but a complete, LIFETIME-GUARANTEED building system. This unique process has passed the many rigorous requirements for trademarking with the United States Trademark office. Through 2015, our trademarked building system allowed us to offer affordable custom pools with waterfalls, extended walls, lower bar areas, and other features not possible with any steel kits or fiberglass pool systems. The KUSTUM KRETE SP® concrete wall system is very similar to those seen on various episodes of “Cool Pools” and “Epic Pools” featured on the Discovery Channel, the Travel Channel, and Animal Planet. It allows for a broad spectrum of pool designs, regardless of location or type of terrain. A perfect fit for western Pennsylvania!! The KUSTUM KRETE SP® technique relies on forming and pouring solid, steel reinforced concrete walls. 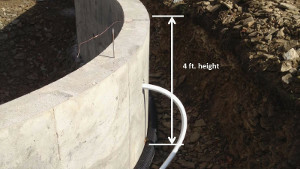 This tried-and true construction method is also utilized by premiere homebuilders for strength, durability, and the ability to resist groundwater seepage. This pool is not simply a pool. It is an entire trademarked system that covers the entire building project. 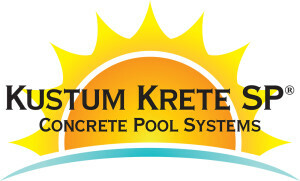 A KUSTUM KRETE SP® pool is built to specific parameters for the pool walls, pool bottom, and concrete decking. Each of these guidelines must be met to qualify as a KUSTUM KRETE SP® pool. For additional detail on the KUSTUM KRETE SP®building process, please click here. To see a variety of the style of pools available from Pool Pros, click here.